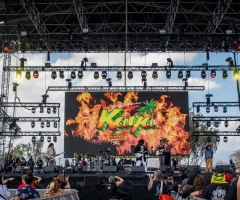 With anticipation and temperatures running high in San Bernardino, California, reggae and hip hop lovers waited patiently outside the gates at the NOS Events Center Saturday, April 29th for the 2nd Annual Kaya Festival to kick off in royal red, gold and green fashion. Once inside, there were many art installations to dazzle over on the way to the single stage arena, where Anuhea was already setting the standard for the day. The reggae-infused world music of Indubious kept the vibes high, with east coast band Roots of Creation performing their renowned Grateful Dub set following shortly after. Despite the shocking inland heat, festival attendees were dancing along to the reggae beats! Miss Marcia Griffiths graced the stage midday in queenly attire, who was then succeeded by recent GRAMMY-nominees Common Kings. Their high-energy set hyped up the crowd like no other. 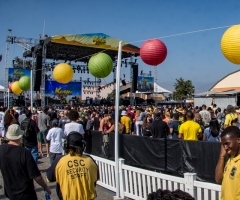 Despite the shocking inland heat, festival attendees were dancing along to the reggae beats! Inner Circle got everyone singing a-la-la-la-la-long, a long-long-li-long-long-long, before Kaya Fest threw down some gangter rap by chef, actor, wrestler extroadinaire Action Bronson. The joint never went out either. South of the border star, Yandel, brought the lights, the girls and the Latino presence until Jamaican legends Toots and the Maytals brought back the roots. Speaking of roots, the whole festival was to commemorate Bob Marley's Kaya album hitting 40 years, so the Marleys were onsite in full force! The first Marley of the night was Bob grandson Skip Marley, who whipped out a solid solo performance before being joined onstage by cousin Jo Mersa Marley. After Jo Mersa ignited the night, all five Marley Brothers took the stage as a unified unit, taking turns to sing songs off the Kaya album one by one. Being Stephen Marley's brainchild, Stephen stood beaming out upon his festival turnout, smiling from ear to ear, with brothers Ziggy Marley, Julian Marley and Ky-Mani Marley all singing their parts on classic Bob songs. And, of course, Damian Marley rapped in between verses in his signature reggae-meets-hip-hop bad boy style. It was a sight to behold, to say the least. 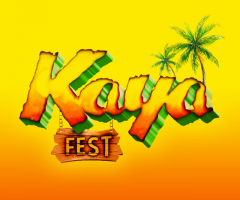 For more Kaya Festival 2018 coverage, please explore the site for a weekend recap and stay tuned for the Day Two gallery to come.